Posted by WorldbyStorm in Workers' Party. 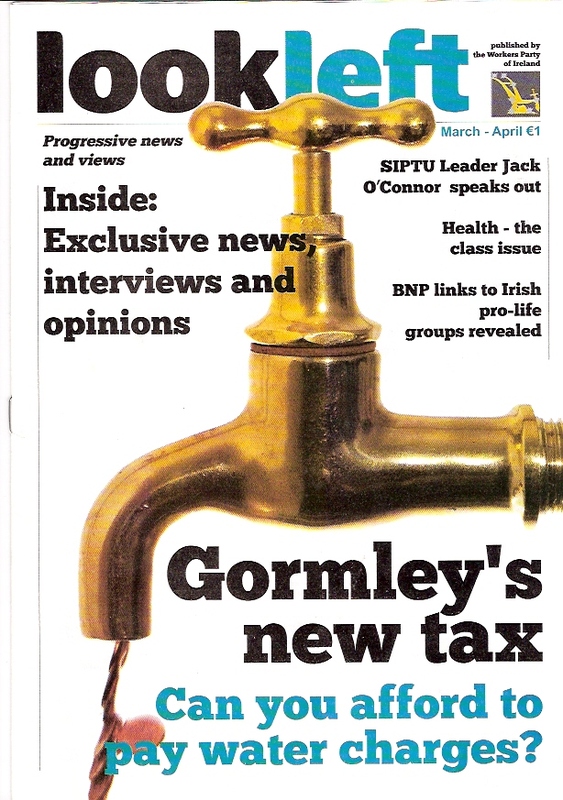 As an independent media outlet, supported by the Workers’ Party, Look Left intends to play its part countering these problems by providing a non-sectarian platform for progressive news, views and debate from working class communities as well as from a wide range of left-wing activists. It’s a dramatic improvement on the old WP web presence and, judging by the cover above, on the physical presentation of Look Left, both of which were amateurish frankly. The website is a bit sparse in terms of content, but that’s only to be expected when it’s only just been launched. Fair play to them on the step forward. I’ll definitely be adding it to the list of blogs/sites I have a look at regularly. I’m a bit confused though by the notion that it’s an “independent” media outlet, when it says on the front cover that it’s supported by the Workers Party. Do they mean independent of the corporate media, or is there some Morning Star style “independent” ownership structure? “Independent of corporate control”. Although it’s a WP publication the intention to be a “non-sectarian platform for progressive news, views and debate from working class communities as well as from a wide range of left-wing activists” seems pretty clear. There’s a piece in this issue from Labour’s Cian O’Callaghan for example which is worth a read. That would make sense. I just found the “independent media outlet supported by the Workers Party” thing a bit odd. I think it’s a good step. The Socialist Party and SWP have fairly new and fancy websites. And of course there are some excellent left wing blogs, not least this one. Plus Indymedia. It’s good to see another professionally put together left site, and whatever your view on the WP they certainly have a record of producing high quality publications. As I said above, while there isn’t much up on it yet, criticising a brand new site for being a bit sparse on the content front isn’t very fair. I’m certainly planning to follow it over the next while. Barracka books shop in Cork. it’ll be in Solidarity Books in Cork in a few days. Will hard copies be on sale anywhere in Dublin? I would love to see a good international section in this ,but at the same time prioritise local burning issues .A modern day Irish People.Nice one. As someone said, it’s content-light, but I’m sure that’ll change soon. You can also buy copies in Dublins Seomra Spraoi. Anyone wishing to contribute to the site or magazine or who has a story they think is worthy of publication should e-mail lookleftonline@gmail.com. All feedback most welcome.